Everyone needs to change up their routine occasionally. I love the foods of France, Italy, Spain...basically the Mediterranean...and I never veer too far from these influences. But today's salad is a departure. I teach it in one of my summer salads classes and it is always a hit. Because Asian food is not my area of expertise, I'm not going to elaborate too much on the details of the recipe. Rather, I will just point out a few things that will help you navigate these flavors and ingredients if they are totally unfamiliar to you. The salad features Soba noodles. Made from wheat and buckwheat, their color is not particularly appetizing, but they are delicious and have the pleasant nutty character of buckwheat. I have always enjoyed them cold, in salad-type preparations. They should be cooked al dente and then rinsed under cold running water. The rinse will stop the cooking process and rinse away excess starch. You should keep rinsing until the water is clear and the noodles are cold. Drain them well after they have been rinsed. If they have a lot of water clinging to them, the salad will be watery and the flavor of your dressing will be weaker. In his book Plenty, Yotam Ottolenghi tells you to spread the rinsed and drained noodles on a kitchen towel to wick away the excess water. I have found this works pretty well. The recipe I'm sharing today was actually inspired by that salad in Plenty. The original is vegetarian. I have added fish sauce to the dressing and topped the salad with beef instead of eggplant...so it is no longer vegetarian...but the vibrant and contrasting flavors of the tangy sauce, fresh herbs and sweet mango are all still there. I have never made the original (I'm not sure why...I love eggplant), but if you are vegetarian, I'm sure it would be delicious. If you are unfamiliar with fish sauce (nuoc mam or nam pla), I tend to think of it as the Southeast Asian equivalent of anchovies. It is fishy and salty...and should be used in small amounts. Just as with anchovies, typically you shouldn't taste the dish and think that you are eating fish...rather, the dish should just be more well-rounded and well-seasoned because of its presence. You could omit it and just increase the salt in your recipe, but you will lose depth of flavor and the intense savory quality that it adds. cut a thick slice down one of the wide faces of the flattened oval shape of the mango. The chunks of flesh that have been cut away from the seed can be diced...or sliced...as you prefer. When you choose a mango for this salad, it should be ripe (the flesh will yield a bit to slight pressure) but firm. If it is too ripe, it will tend to disintegrate into the salad as it sits. When finished, this salad should be an exuberant medley of flavors and textures. 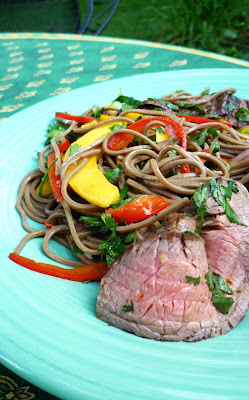 Juicy, sweet mango.... crisp sweet red pepper and red onion.....aromatic basil and cilantro (use as much of both as you like)....juicy, rich and savory beef....all bound together by the backdrop of the nutty and slightly chewy soba noodles and a tangy-salty-slightly hot and sweet dressing. Really....a party in your mouth. You should feel free to adjust the flavorings and additions until you achieve this effect. My next post will most likely be planted firmly back in my regular territory. If you visit my blog expecting to find ideas for seasonal produce...most often utilizing the flavors of the Mediterranean...I hope you don't mind the departure today. I find this salad to be refreshing and satisfying—not only in its own right—but also because it is so different from the foods I normally prepare. If you try it, I hope you will agree that it is just the thing for a hot summer night. Combine the first eight ingredients in a small bowl, whisking to blend. Cook the noodles in a large pot of boiling salted water until tender but still al dente—about 5 minutes. Drain in a colander and rinse under cold running water to stop the cooking process. Shake the colander and spread the noodles on a kitchen towel to wick away any remaining excess moisture. Transfer to a large bowl and combine with the onion, bell pepper, mango and half of the herbs. Drizzle in about a third cup of the sauce and toss until everything is well coated (adding more sauce if necessary). Salt to taste. Set aside for up to half an hour. To prepare the steak, heat a large sauté pan (cast iron is perfect) over medium-high to high heat (or preheat the grill to medium-high). Season the steak(s) well with salt & pepper. Add enough oil to barely coat the bottom of the pan (oil the steak if grilling). When the oil in the pan is almost smoking, add the meat to the pan. Sear the meat on both sides until splotched with color. Reduce the heat and continue to cook the steaks, turning at regular intervals (don't forget the edges) until the steaks have reached your preferred doneness. (If you are grilling, simply place the oiled and seasoned meat on the clean, preheated grill and cook, turning once, to your preferred doneness.) Remove to a plate, drizzle with a couple of tablespoons of sauce and scatter with a couple of tablespoons or so of the herbs. Turn to coat. Let rest, for at least ten minutes...longer is better. Slice thinly, returning the sliced meat to the mixture of sauce and drippings and herbs. Set aside. When ready to serve. Toss the noodles with as much of the remaining sauce as you like (I usually use all of it) and mound on a serving platter or individual plates. Depending on appetites, you may of course increase the meat to as much as a pound...or more. If you don't like fish sauce, leave it out. Season the sauce with at least a half teaspoon of salt.